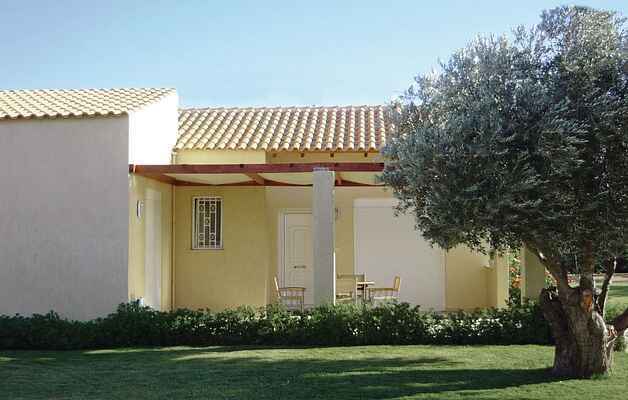 GAT122 & GAT123 are two semi detached houses located in the area of Kalamos just 48 km from Athens international airport and the same distance from the center of Athens. These two houses are within a really big garden, sharing the swimming pool and the deck chairs with other houses in the complex. Each house has two bedrooms, a double and a single one, in the living room a cozy and comfortable sofa bed for another person, and a baby cot. Children will appreciate the playground equipment: swing, slide and seesaw. Each house has its own covered terrace to enjoy your dinner or relax throughout the day. In the common fenced garden, there are paths to stroll and children will play around safely. The area of Kalamos and especially the beach of Agioi Apostoloi are perfect for family holidays. In the area, you will find both pebble beaches, and many options for day trips to archeological sites such as Delphi, Athens or a little bit further away to Epidaurus, Meteora and Olympia.